Almarai is one of the largest Dairy Products Company in the World which was started in Riyadh, Saudi Arabia at 1977. Almarai produces Dairy Liquids, Fruit Juices, Poultry, Foods etc. 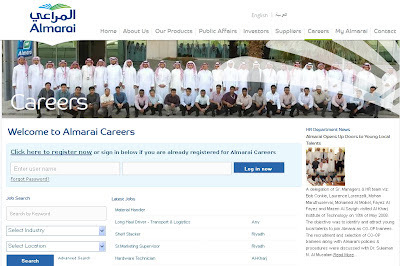 Interested Job Seeker can visit the Almarai Career website and click on Register and fill the information asked and Attach the CV and click Save Button. Once you are Registered you can search for Vacancies and select the desired vacancy and click on Apply Now. You can apply for any vacancies in future simply by Login to the career page with the details and search and apply for the vacancy.